It was 3am. A young girl was hammering at our front door. 'You have to pray for me!' The father of her baby had just been stabbed by his best friend over some money. Because he was a drug user, the medical staff at the hospital couldn't stop him bleeding. So he died on the operating table. Nineteen years old. 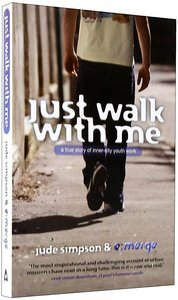 Just Walk With Me tracks a year in the life of Christian youth project e:merge in Bradford, starting with the arrival of Niki fresh-faced, full of spiritual optimism and an expert in running perky school assemblies. Yan, the project's Director knows that working here will force Niki to abandon or reform nearly all her attitudes to evangelism and quick-fix faith. But he also knows that God's grace can change even the most excluded young person. 'A bitingly honest, extremely engaging and at times laugh out loud funny account of no holds barred youth work.' Rachel Gardner, youth worker and presenter of BBC2's Romance Academy 'It pulls no punches I commend it to all who seek to engage with unchurched young people today' - The Rt Revd David James, Bishop of Bradford 'gut-wrenchingly excellent' Andy Flannagan, worship leader and campaigner As well as being a dynamic resource for youth workers, this book will appeal to all Christians willing to challenge themselves about the realities of poverty, deprivation and God's saving grace. with a foreword by Prof. Michael H. Taylor, lecturer in Social Theology at the university of Birmingham. About "Just Walk With Me"
:It was 3am. A young girl was hammering at our front door. 'You have to pray for me!' The father of her baby had just been stabbed by his best friend over some money. Because he was a drug user, the medical staff at the hospital couldn't stop him bleeding. So he died on the operating table. Nineteen years old. Just Walk With MeJ tracks a year in the life of Christian youth project e:merge in Bradford, starting with the arrival of Niki fresh-faced, full of spiritual optimism and an expert in running perky school assemblies. Yan, the project's Director knows that working here will force Niki to abandon or reform nearly all her attitudes to evangelism and quick-fix faith. But he also knows that God's grace can change even the most excluded young person. 'A bitingly honest, extremely engaging and at times laugh out loud funny account of no holds barred youth work.' Rachel Gardner, youth worker and presenter of BBC2's Romance Academy 'It pulls no punches I commend it to all who seek to engage with unchurched young people today' - The Rt Revd David James, Bishop of Bradford 'gut-wrenchingly excellent' Andy Flannagan, worship leader and campaigner As well as being a dynamic resource for youth workers, this book will appeal to all Christians willing to challenge themselves about the realities of poverty, deprivation and God's saving grace. with a foreword by Prof. Michael H. Taylor, lecturer in Social Theology at the university of Birmingham.